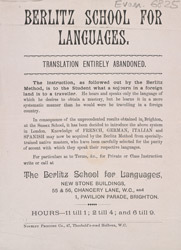 The first Berlitz School for Language was set up by Maximilian Berlitz in Providence, Rhode Island in the United States in 1878. The son of an immigrant rabbi, Berlitz's grandfather and uncle were also lay teachers in the local Jewish community; as a result, the young Maximilian became used to coaching and instructing others. He set up language schools around Europe, making his name when he taught the German Kaiser to speak English. He received medals of honour from the King of Spain and the French government for his distinguished contribution to languages and the communication of nations. As well as famous pupils, his schools have had many famous teachers: perhaps most notably the Irish novelist James Joyce, who taught at a Berlitz school in Trieste.